Toilet seats are often considered the dirtiest objects. Though many objects around us are more polluted than the toilet seat, some of them are even very close to us, you know. Many types of germs inhabit toilets, especially toilets that are used publicly — starting from the virus that causes colds and flu, up to the bacteria Streptococcus and E. coli. However, objects that we touch and hold every day can also be nests of bacteria and viruses, which are even more than toilet seats. Our fingers are easily attached to bugs. If we hold our eyes, mouth or nose, the germs even move and can enter the body. Therefore, you are recommended to always wash your hands with water and soap for 20-30 seconds, especially after from the bathroom. A study found that the type of bacteria that is on the cell is ten times more compared to the toilet seat. Not surprising, because this one thing we often put anywhere. To prevent the increase of bacteria on cell phones, start by not carrying and using it when we are in the bathroom. Although often used for cleaning teeth, toothbrushes can also be an ideal place for the growth of bacteria and fungi. Especially if not stored and cleaned correctly. For that, always keep your toothbrush clean before and after use. 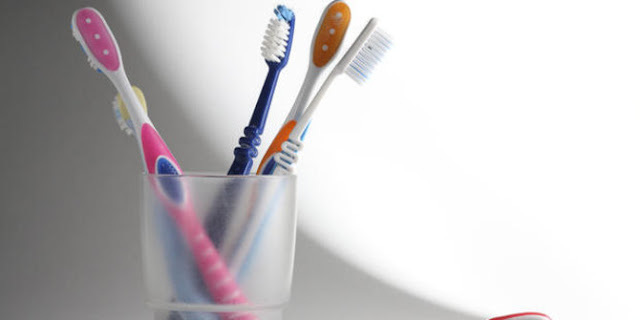 You don't forget and change your toothbrush every three to four months. It is considered a cleanser, but actually, there are lots of bacteria inside the dishwashing sponge. Is because damp and wet sponges can be an ideal place for bacteria to breed. Try heating the sponge in the microwave for one minute, so the bacteria die and replace the sponge before it smells. Pets can also be a means of transmitting viruses and bacteria, especially if your pet often plays outside the home. The eating bowl and toys can also be a perfect place for bacteria to breed. For your favourite animal not to become a nest of germs, diligently bathing it. Also, clean the eating bowl and play regularly. Bathroom door handles, microwave handles, and lamp switches are other places that can be a nest of bacteria. Therefore, routinely clean these places at least once a week to eliminate bacteria. So, don't be lazy about cleaning. Getting your hands washed with soap is also very important, especially after using the toilet, before and after cooking, before eating, after cleaning the house.